It is springtime in Montana. I have a few bulbs starting to sprout in my flowerbeds. Then Mother Nature dumps snow on my pretties – ugh! This week we received a new ruler in 3 sizes. The “Clammy 6”, 8” & 12”. It looks like just a clamshell ruler but it is so much more! Five shapes can be cut using these rulers: Clamshell/ Glam Clam; Circles, Half Circles, Orange Peel, Drunkards Path & Quarter Circles. Several new patterns to go with the rulers. Patterns and rulers are by Latifah Saafir Studios. You can view a Youtube video on her site. 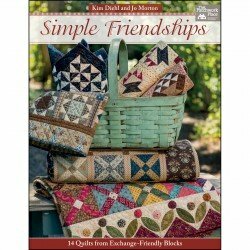 A new book from Kim Diehl and Jo Mortan – “Simple Friendships”. Two inspriring designers team up for amazing quilts. 14 quilts are featured in the new book. Para-Cotton Poly This 80wt thread comes in 40 amazing colors on 400m spools and has been thermally treated to remove undesired stretchiness and shrinkage. This process reduces the shiny sheen to make the thread feel, stitch and look like mercerized cotton! GREAT for quilters, fiber artists and embroiderers. Quilters everywhere have fallen in love with Alex Anderson’s Quilters select line of rulers, cutting mats and battings. Now Alex is proud to add Quilters Select thread – PERFECT for hand piecing, machine quilting, embroidery and MORE! Stop in and see this wonderful thread. a guide on your needle plate. Get perfect 14 inch seams. Are you needing a new project? We have so many new kits available. Stop in for inspiration. This week I want to talk about rulers. We talk about always starting a new project with a new sharp needle. We stress the quality of thread being put through your machine. I want to stress the importance of using a good ruler! My basic rulers I use for quilting are Creative Grid Rulers. For one thing they are made in the USA! Woot Woot! The rulers have built in grips on the bottom so they hug the fabric and don’t slip. When using their square or rectangle rulers, one side has inch markings and the opposite side has 12 inch markings with a black circle around them so at a glance you can see what side you are using. So many other brands out there have too many markings. They are hard to read. Most of Creative Grids rulers have a You Tube Tutorial on the web. I use these all the time to figure out how to use them and for teaching. Their instructions for specialty rulers that are printed and included with the rulers are very detailed. I tell my customers to laminate the instructions for safe keeping. I clip them to my ruler so I can always have a quick reference to read about how to use them. Creative Grid has over 100 rulers and templates. They are preferred by most quilters as the ruler of choice. They are continually creating more rulers for specially techniques in quilting. So next time you go shopping, pick up a new ruler to add to your sewing room. One ruler does not do all the jobs in quilting. Think of it as a tool and any good tradeswomen needs LOTS of tools. The newest ruler in the Creative Grid line: 8 12” x 18 12 “. It is the perfect size to span the most popular size of rotary cutting mats. And, since it is 25% smaller than the original 24-1/2" version, it is easier to manipulate. The wide width makes it the perfect choice to square up corners and borders. We have added a new thread rack from Superior Threads. Beside the King Tut Varigated Thread, the solid King Tut thread for quilting has arrived. Great for top stitching, machine quilting and applique. Use a 9014 top stitch needle when sewing with these threads. while looking at the winter scene from my sewing room window. The UPS man has been busy delivering new goodies to the store. New wide quilt backs are filling the shelves. We have a nice selection. We now carry a few of the 90 inch wide Cuddle fabrics for quilt backs. More colors to arrive soon. Perfect for all ages as it is so soft and cuddly! When you cut or nick your finger, we have the band aids for you! New fun band aids just for sewers! Come in and see them!!!! Fun band aids aren’t just for kids anymore. If you want a fun way to make half square triangles and a quick way to make certain quilt blocks then sign up for our Ruler or Technique of the Month class being held Wednesday, February 15th. I will show you the new “Cake Mixes” from Moda using 10” fabric squares. Several new fabrics with a sewing theme are here! Perfect for curtains, totes, aprons, ironing board covers or however you want to decorate. I really like the piece that has images of “bias tapes”. Cute Cute! Stay warm and sew on!